Illustrated The Spiderwick Chronicles, which were written by Holly Black. Do not combine them. speaking & signing The Battle for WondLa: Search for WondLa #3 The super fantastic author and illustrator Tony DiTerlizzi is here tonight with the final book in his bestselling trilogy for young readers! Complete with lavish two-color illustrations and spot art throughout, and starring a host of unforgettable characters that reinforce the importance of friendship, we're prepared to have our socks knocked right off our feet by this latest book from the man behind such classics as The Spiderwick Chronicles (with Holly Black). Kids, don't miss it! Eva Nine is at her bravest in the final book in the bestselling trilogy from the fantastical mind of Tony DiTerlizzi. All hope for a peaceful coexistence between humankind and aliens seems lost. Eva has gone into hiding for fear of luring the wicked Loroc to her companions. However, news of the city Solas being captured by the human leader, Cadmus Pryde, forces Eva into action once again. With help from an unlikely ally, Eva tries to thwart Loroc's ultimate plan for both mankind and the alien life on Orbona. Complete with lavish two-color illustrations and spot art throughout, and starring a host of unforgettable characters that reinforce the importance of friendship, The Battle for WondLa has all the hallmarks of a classic book--of the future. Tony DiTerlizzi is a bestselling author and illustrator who has been creating books with Simon & Schuster for more than a decade. From his fanciful picture books like Jimmy Zangwow's Out-of-this-World Moon Pie Adventure, Adventure of Meno (with his wife, Angela), and The Spider & The Fly (a Caldecott Honor book), to chapter books like Kenny and The Dragon and The Search for WondLa." Tony always imbues his stories with a rich imagination. His middle grade series, The Spiderwick Chronicles (with Holly Black), has sold millions of copies, been adapted into a feature film, and has been translated in more than thirty countries. In order to have anything signed at a BookPeople event, a copy of the event book must be purchased from BookPeople. If you purchase your book from BookPeople in advance of the event, please save your receipt and present it at the event. Thank you for supporting Tony DiTerlizzi & your local independent bookstore! 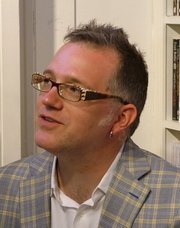 Tony DiTerlizzi is currently considered a "single author." If one or more works are by a distinct, homonymous authors, go ahead and split the author. Tony DiTerlizzi is composed of 7 names. You can examine and separate out names.